If you didn’t watch last week’s episode of AMC’s The Walking Dead, “Live Bait,” or if you want to avoid potential spoilers for the next episode, “Dead Weight,” STOP READING NOW. Seriously, there are SPOILERS beyond this point. Keep on moving. 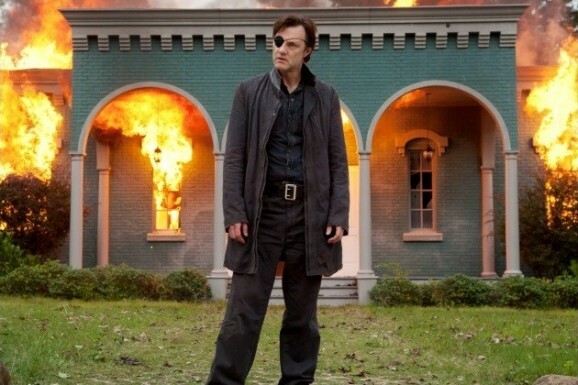 “Live Bait” reintroduced fans of the zombie drama to the Governor (David Morrissey), and threw him into the fray of season four with his very own standalone episode. This was a kinder, gentler version of character, except for that moment when he crushed an old man zombie skull in with a fire extinguisher in front of his family. But that needed to be done, so you can forgive it. For the most part he was disturbed and wounded, but not a total psychopath. At the end of the episode, when he encounters his old hoodlum cronies from Woodbury, you start to wonder if he is going to fall back into his old ways. If a new photo and trailer from New Zealand are any indication, an iconic moment from Robert Kirkman’s comics could be on the horizon for Sunday. Three years ago The Walking Dead enthralled viewers across the country, gathering 5.35 million viewers for its premiere. Over the years, the series’ audience has grown exponentially. Viewership for The Walking Dead is at an all-time high—season four brought in 16.11 million viewers for its season premiere—but let’s not forget that the series has been on shaky ground ever since its executive producer, Frank Darabont, who developed the series for AMC, left the show. He’s been reluctant to talk about his departure, until now. A few weeks after The Walking Dead panel at San Diego Comic-Con in July 2011, the cable network announced that Darabont would no longer be the showrunner, and that he had stepped down from his duties. At the time, it was unclear why he left, but it was believed that it was due to disagreements with network executives about budgeting and scheduling. While The Walking Dead is AMC’s most popular show, the network is very savvy about keeping production costs low. 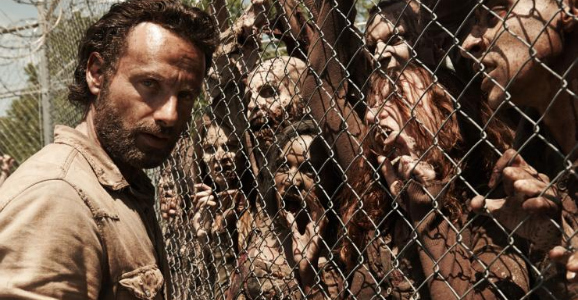 Last night’s episode of The Walking Dead took a break from Rick Grimes and his group at the prison. 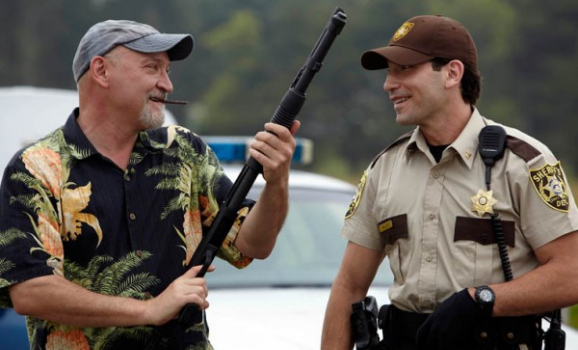 While the first few episodes dealt with a deadly plague that slowly took over the prison’s residents, the episode “Live Bait” caught the audience up on the whereabouts of the Governor after the massacre in season three. AMC has released new promos for the next episode, “Dead Weight,” and behind-the-scenes videos for last night’s episode. 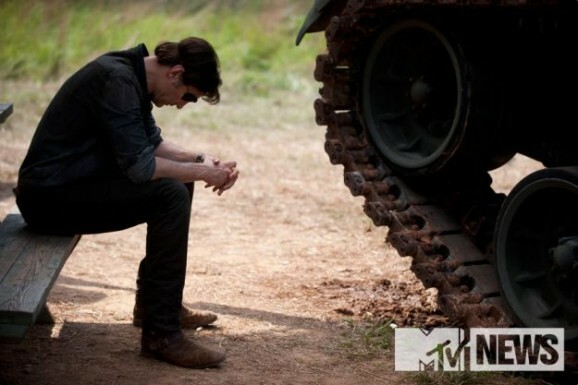 Tomorrow’s episode of The Walking Dead will see the long awaited return of the Governor. We haven’t seen him since season three’s finale episode, “Welcome To The Tombs,” after he went mental and killed off his own people. His return should inject some much-needed life into the show after the deadly plague storyline that went nowhere slow. While David Morrissey plays the villainous Governor in an extremely vile way, the British actor’s recent appearance on the daytime talk show Ellen shows that the actor is very different from his onscreen persona. While promoting his return, Ellen DeGeneres gave Morrissey a good scare during his interview. The talk show host asked him if being surrounded by extras dressed as convincing zombies has ever scared him, and he recalled an amusing anecdote about his first day on set. During the short story, a man dressed in a not-so-convincing zombie/gorilla mask snuck up and startled the actor from behind. For many of you, the word prequel causes a visceral, involuntary cringe response. George Lucas made sure of that. The fact that anyone still uses the term after it was poisoned like that is amazing, but the truck just keeps right on rolling. This is also the latest description floating around in regards to the impending spinoff of AMC’s massive horror hit, The Walking Dead. While this adds a touch more clarity to the show, content wise, there is also an idea, though equally vague, of when we could see this series. Comic creator Robert Kirkman, who is birthing the show along with fellow Walking Dead producers Gale Anne Hurd and David Alpert, has said that the series will explore different aspects of the zombie epidemic. According to the folks over at TV Line, the water cooler buzz is saying that this could mean exploring the days leading up to the outbreak and all of the efforts to contain the spread. You know, all the stuff that the Rick Grimes (Andrew Lincoln) missed when he was out cold in a coma at the hospital.